STExclusively at Chipotle, you can get a Whole30 Salad Bowl, the perfect compliant on-the-go or travel meal for your Whole30. 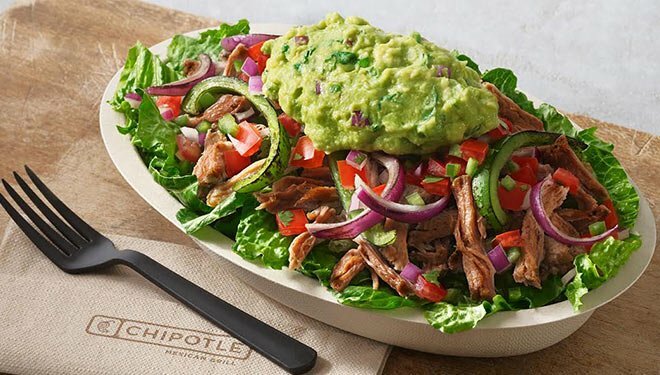 Available when you order at chipotle.com or via the Chipotle app, the Whole30 Salad bowl features crisp romaine lettuce, fajita veggies, satisfying carnitas, guacamole, and tomato salsa. Why isn’t this option on the in-store menu? 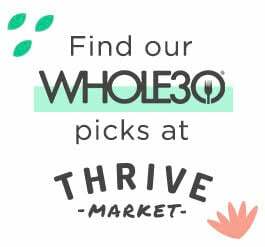 You’ll only see the Whole30 Salad Bowl as an ordering option online or in the mobile app; you won’t see it listed on the in-store menu at your favorite Chipotle location. But if you’re on the run with no time to order in the app, we’ve got you covered! Build this very same Whole30 bowl in-store by asking for the compliant ingredients by name: romaine lettuce, carnitas, fajita veggies, tomato salsa, and guacamole. We’ve even made you this handy graphic … click here to download it. Save it on your phone so you remember exactly what goes into the #Whole30SaladBowl. Why is Chipotle offering “extras” at the end of the order that don’t fit the Whole30 program (like chips and salsa, or a soda)?  This function is built into the Chipotle app and website and cannot be changed, since someone may place an order for an entire family or office and not just THEIR bowl. 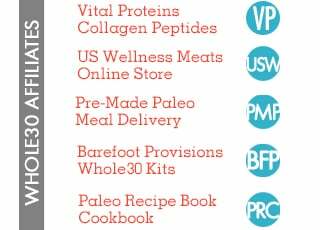 Steer clear of any of those add-ons to keep your #Whole30SaladBowl compliant. I thought the fajita veggies were cooked in non-compliant rice bran oil? Not anymore; now they’re using sunflower oil for the veggies! Chipotle is constantly updating its menu and food prep practices in order to meet the needs of their guests. This change—cooking their fajita veggies in Whole30-compliant sunflower oil—allows you to order the Whole30 Salad Bowl from Chipotle as a totally compliant on-the-go meal. How long will the #Whole30SaladBowl be available? 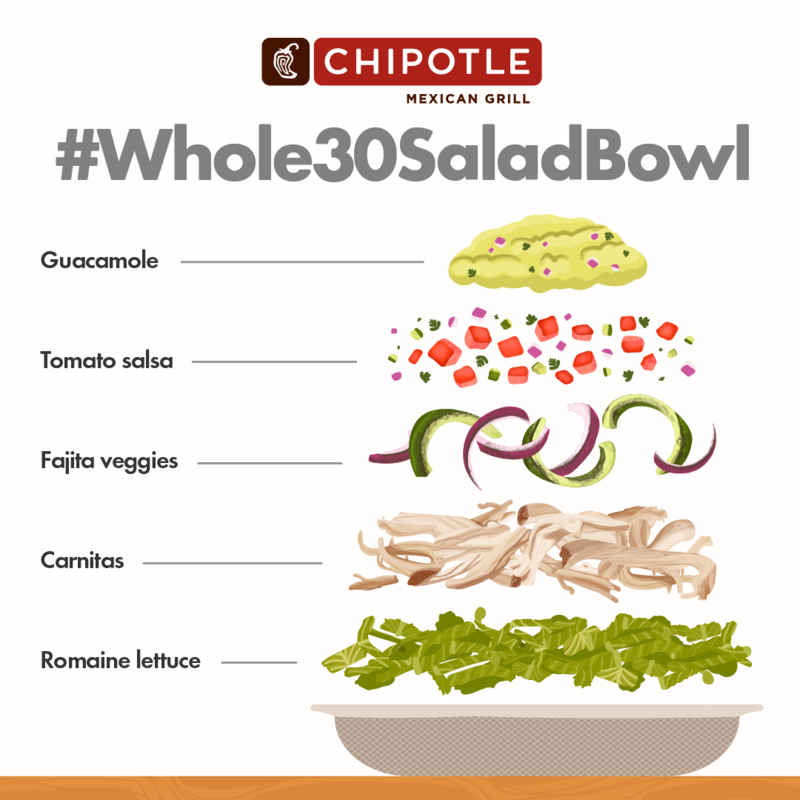 Whole30 and Chipotle have joined forces to support the Whole30 community with the #Whole30SaladBowl throughout 2019. Is tomato salsa the only compliant option at Chipotle? The corn salsa is NOT compliant; the other three salsas are. When you order the Whole30 Salad Bowl in the Chipotle app, the tomato salsa is automatically added. But if you’re ordering in store, you can add the salsa of your choice.